Zion felt to me like a national park administered by Disneyland, with its $25 entrance fee, sprawling visitor center, and buses waiting to shuttle the summer throngs up the canyon. 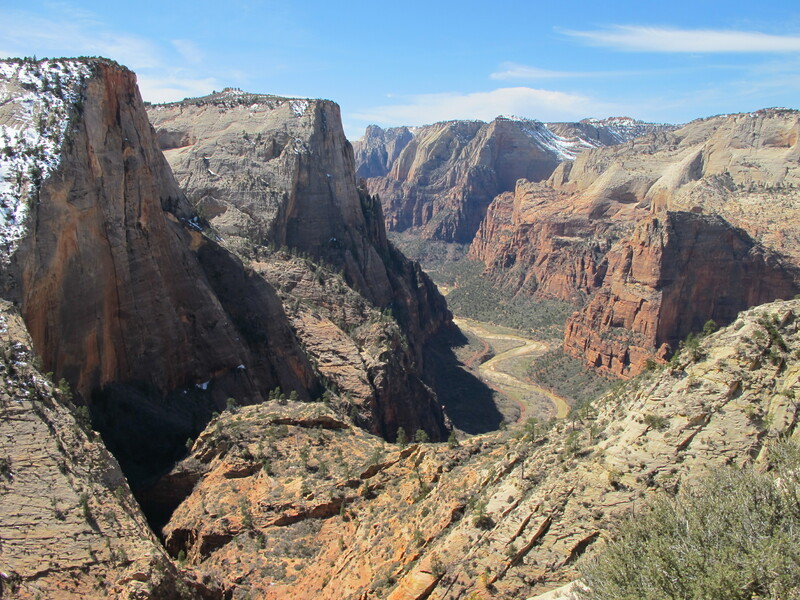 While I was at Zion, I hiked a six-mile trail of winding switchbacks up a narrow slot canyon and over a running stream to take in the view at the rim of the big canyon and I didn’t see a single footprint – because the entire trail had been paved. Not my idea of wilderness. 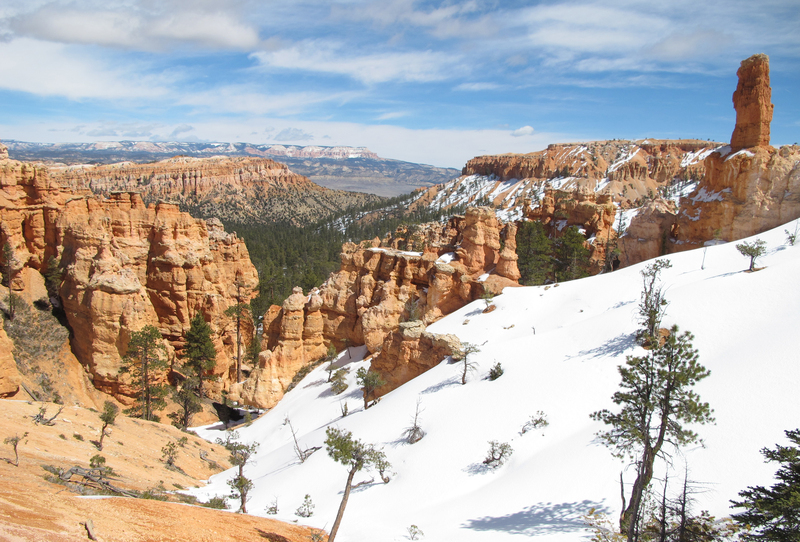 Bryce Canyon and Capital Reef were quieter and less developed, but there was still a gloss of sanitation and regulation throughout – the RV friendly campgrounds, the pavement-bound tourists, the roadside signs full of rules and directives. 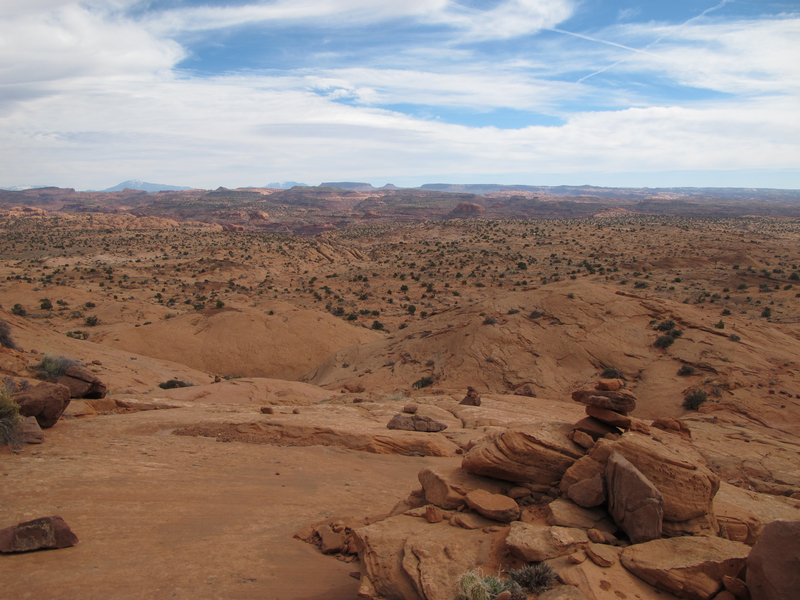 All three parks were stunning in their beauty and enormous beyond what I could reach in a day or two, but I had come to southern Utah to get off this paved, signposted path. I pulled into Escalante, Utah – a windblown little town perched on the edge of a vast wilderness, the Grand Staircase Escalante National Monument – too late to catch the rangers at the modest visitor center but was fortunate to find a guiding operation with its door open. 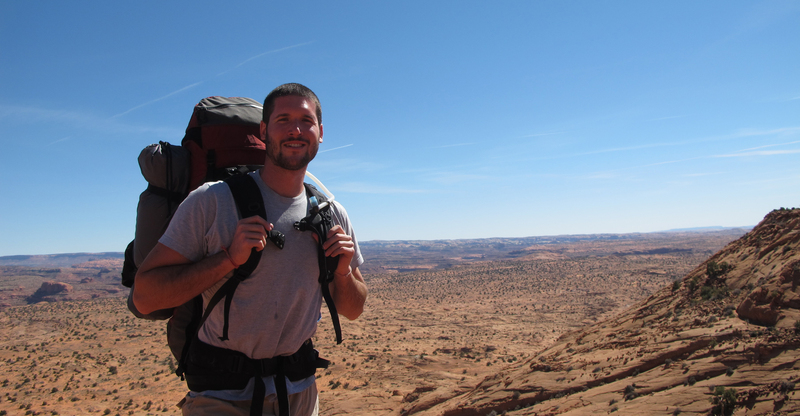 When I met the owner, Rick Green, and told him I was looking for a three day hike into the canyons he thought about it for a moment and said, “You should go to Neon. 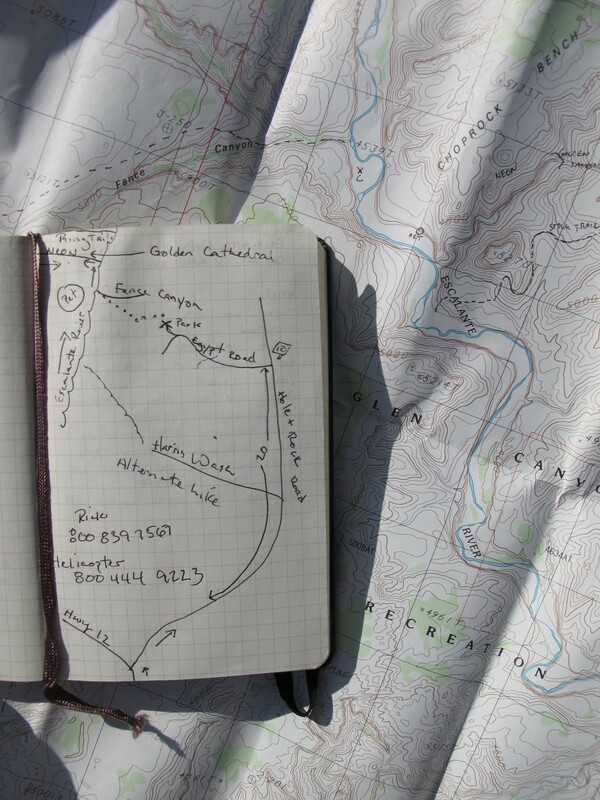 I’ll draw you a map.” Which he did. Perhaps after assessing my newness in town he kindly lent me a guidebook and jotted the 1-800-number for a helicopter rescue, just in case. Not that I would have cell phone reception out there. Drive five miles east of Escalante on panoramic Route 12, then turn south down the dirt Hole-in-the-Rock Road for 16 miles, then east on the Egypt Road another 10 miles, through dry washes, past the occasional tumbleweed, until you reach the end of the road and then you can start walking. I think my father got a kick out of it when I sent him an email with these directions for the rescue party if I didn’t emerge in a few days. I shouldered my pack (tent, sleeping bag, camp stove, cook pot, bowl, spoon, leatherman, water bottles & filter, granola, oatmeal, dried noodles & curry, change of socks, shorts, jacket, hat & gloves, camera, sunglasses, notebook, USGS “Egypt Quadrangle” contour map, compass, day pack) and began the descent into a wide, sandy plateau where the canyons opened beyond. I was told there would be rock cairns showing the way down to the Escalante River but if there were I soon lost them on one of the long slabs of trackless slick rock. Although I thought this was exactly what I wanted it took me a while to get comfortable with the idea of walking without a trail. I stopped often to check my map and look ahead, trying to discern the opening of a steep side canyon, and to look back to orient myself against the rocky shelf I had descended, knowing that I needed to hit the canyon near the right place to avoid the 150-foot cliffs at its upper reaches and that I would eventually need to find the way back to my car. At first I looked eagerly for a cairn or a human footprint to validate my way, but gradually my eyes began to change their focus – like staring at one of those optical illusions where first you see nothing and then you see everything – and the desert ecosystem began to reveal itself to me in dozens, then hundreds of tiny tracks in the sand: lizard, mouse, bird, rabbit, snake, coyote. 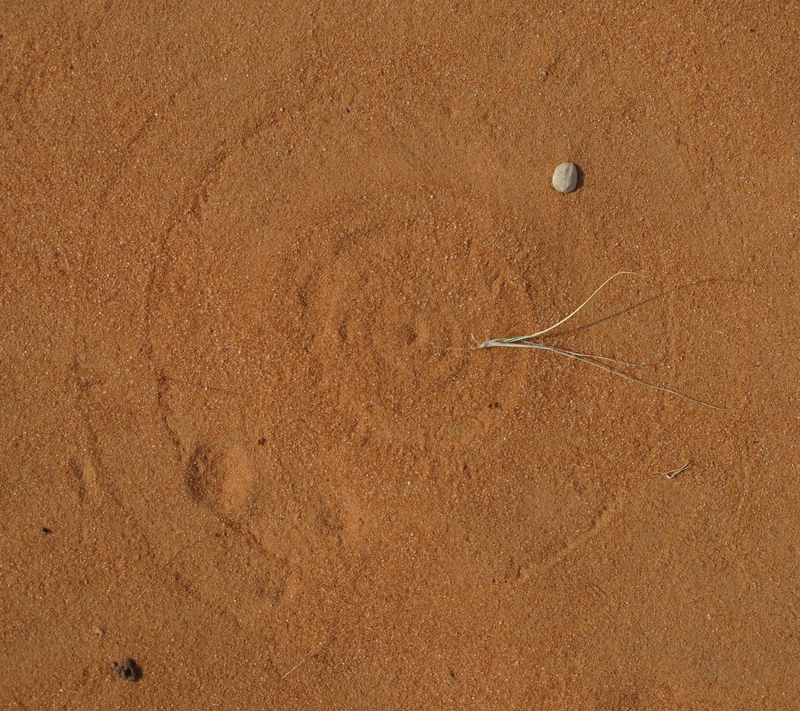 Even a strand of windblown grass left its perfect, impermanent mark. After a mile or more I came across a solitary human footprint in the sand between two sections of slick rock, but it didn’t matter to me anymore. I couldn’t help drawing proximate analogies between this pathless walking and my life. How it is hard at first to be without clear guidance but then liberating to choose your own path and rewarding to find that this might be a more interesting way to walk, even if it requires a little extra time and the occasional double-back. I probably added an extra mile to the walk on my circuitous path toward the canyon, aided by my less-than-perfect contour map reading, but I found the place where the plateau dropped relatively gently toward the canyon floor and discovered a well-worn switchback to ease me down among the cottonwoods and the spring-fed stream cutting through the red stone and green reeds. 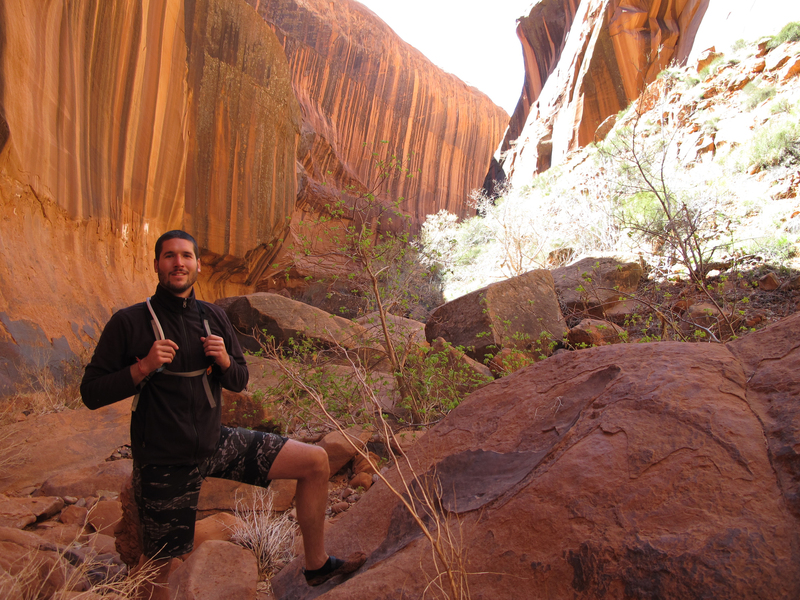 I set up camp on a ledge above piles of driftwood and rivulets in the sand – the signs of past flash floods – then I changed into shorts and set out with my daypack. The Escalante river looks more like a fast flowing creek by Midwestern standards but it has carved a very impressive canyon. Giant cottonwoods and thick stands of brush line the banks and in places the river runs up against the canyon walls, sculpting shady rock overhangs, so that navigating down the canyon I was forced to cross and re-cross the river repeatedly to find old cattle traces through the thick brush. 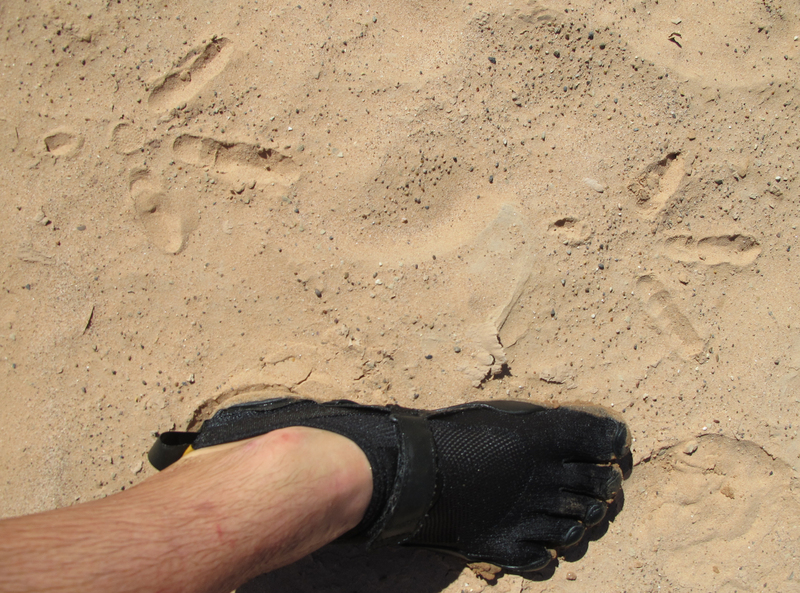 Fortunately I had the perfect footwear for the day, a pair of Vibram toe-articulating water-walking shoes, pictured here next to what I assumed at the time to be a set of fresh dinosaur footprints but was heartbroken to learn, after a loud cluck and gobble at sunset, more likely belonged to a turkey. The only reminders of humans down in the canyon were occasional tracks in the sand and the constant flow of airplanes in the washed out blue sky above. They passed so high I could barely see the shiny planes themselves but the contrails criss-crossing the sky were more noticeable – two distinct white furrows, gradually blurring to one thin white cloud and then disappearing. When I found the wall on the north side of Choprock Canyon where Rick had told me to look, I knew I was in the right place: in the late afternoon sun the wall extended as flat and perfect and uniformly red as a well-prepped canvas. 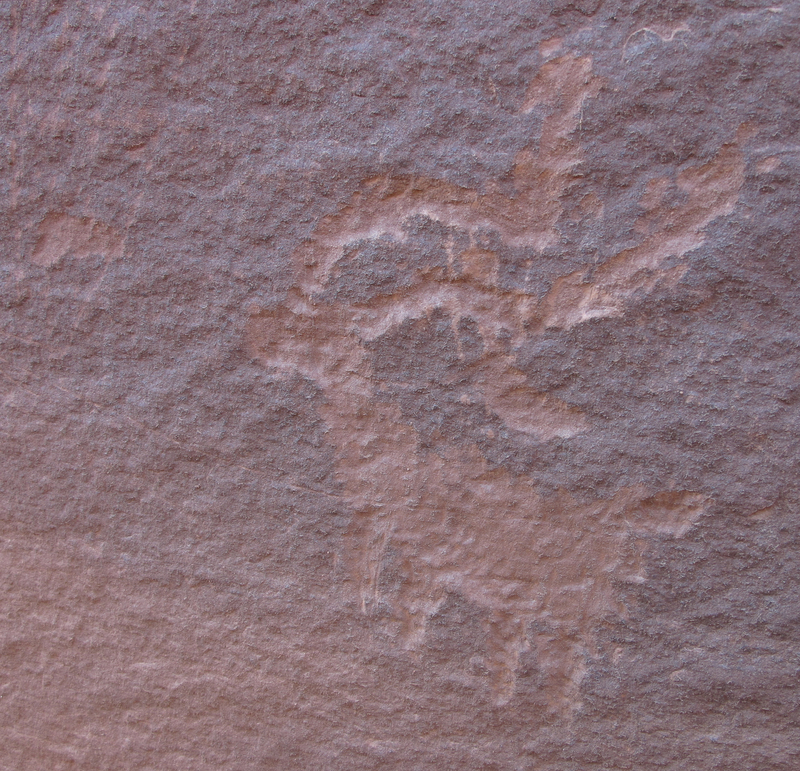 And then I saw the first petroglyph glowing on the wall. They moved me more than I thought they would, these messages authored centuries ago by people living lives incomprehensively foreign to mine, in a world I might yearn for but would barely recognize, much less survive. Yet here they were, speaking to me in a language I think I understood. 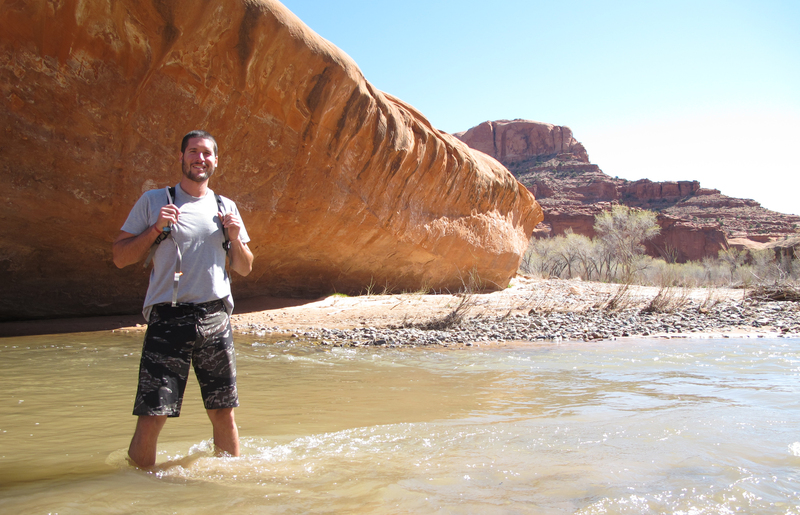 I slept deeply that night in the silent, ancient world of the canyons and woke the next morning to continue exploring south down the Escalante and up two nearby side canyons. Neon Canyon opened like a mystery, its cold wind sending a shiver down my spine. As I turned the corner and followed the dry creek bed for nearly a mile, the canyon walls gradually narrowed so nothing remained but cool, damp shadow. The canyon ended abruptly at the place called the Golden Cathedral, where the sun found a way down to light the sand near a deep pool and there was a double bridge in the rock above where eons of falling water had created first one and then a second portal to the sky above. The mystery solved. 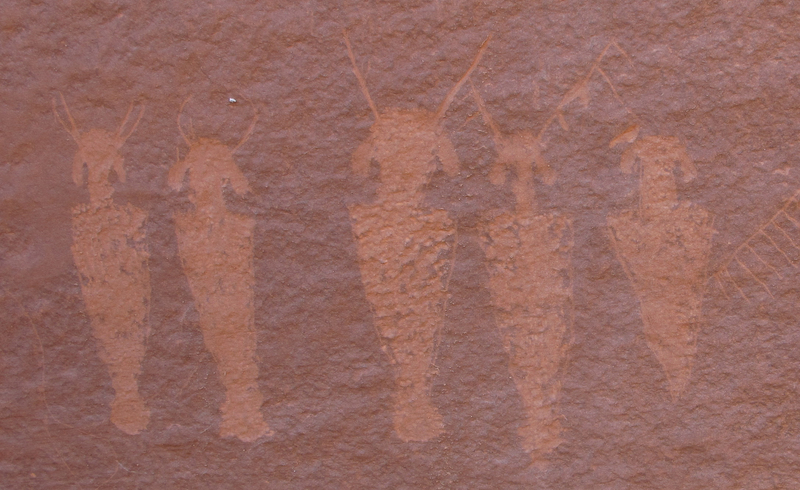 As I was winding my way home from the last, narrowest slot canyon, known as Ringtail, I encountered the first people I’d seen in almost two days. They seemed nearly as surprised to see me as I was to see them and practically all we could do was nod in acknowledgment of this place that is in many ways beyond words. 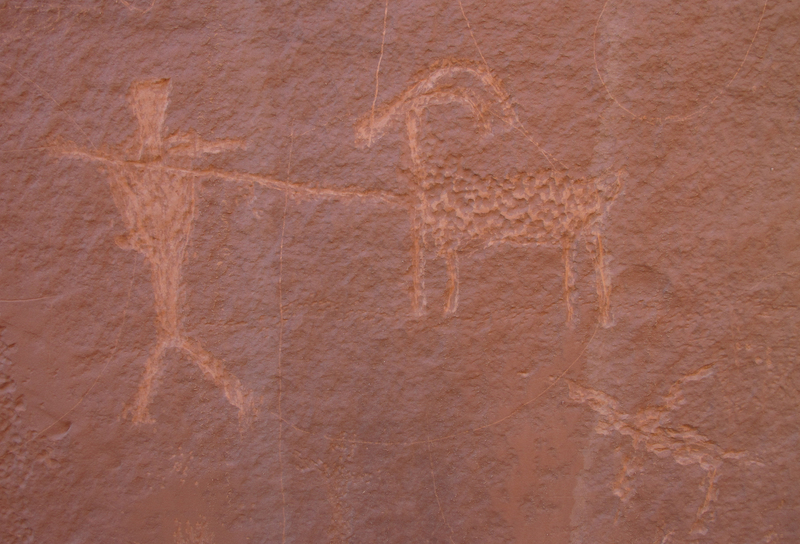 The next time I am in one of those planes crossing the endless red desert on my way from one city to another I will think of the hidden canyons below, a river carving the red rocks to sand, a cool wind flowing out of the shadows, a petroglyph glowing in the sun on a canyon wall.